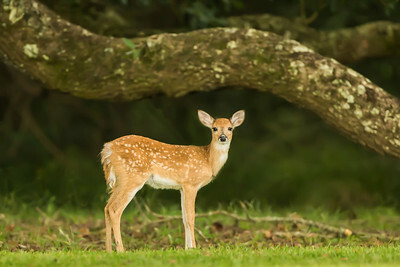 Pam and Edmund McIlhenny's wildlife photos of Avery Island, Louisiana, which is one of five salt domes rising above the flat Louisiana coastal wetlands. This gallery includes photographs of the following species: American Alligator, Anhinga, Armadillo, Bobcat,Cormorant, Deer, Hawk, Great Blue Heron, Green Heron, Little Blue Heron, Tricolored Heron, White Ibis, White-faced Ibis, Glossy Ibis,Lesser Scaup diving duck, Lamb,Common Loon, Otter, Barred Owl, American White Pelican, Brown Pelican, Racoon, Robin, Roseate Spoonbill, Eastern Wild Turkey, and Turkey Vulture. Avery Island is also the home of TABASCO Brand Pepper Sauce, which Edmund McIlhenny's great grandfather invented in 1868. 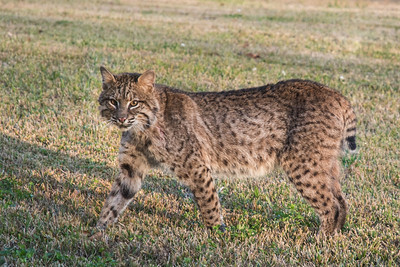 Because the company remains family owned, with its headquarters still at Avery Island, we have had the opportunity over the years to photograph wildlife, as well as some of the most beautiful parts of the Island. We hope you enjoy them. 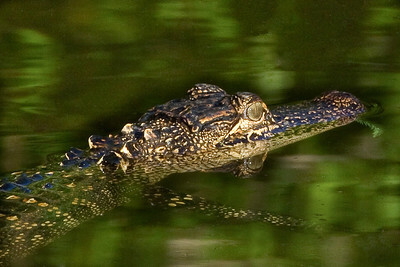 More information on Avery Island is available at http://www.TABASCO.com, and http://www.Twitter.com/A_Island. 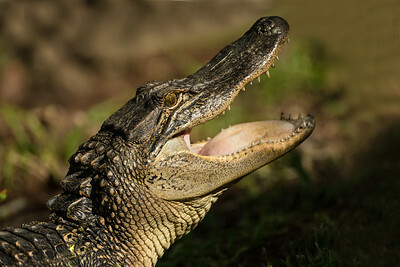 Scientists think the Alligator species has been in existence for 150 million years--a long time considering the dinosaurs became extinct 65 million years ago. 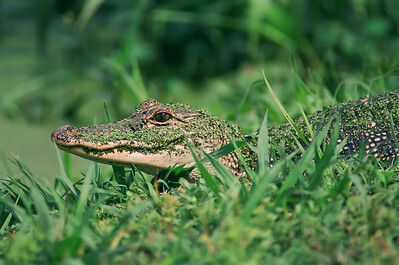 In 1967, American Alligators were themselves facing extinction. 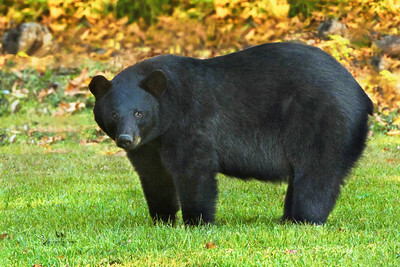 Their complete recovery by 1987 is a tribute to excellent management by state and federal wildlife agencies. 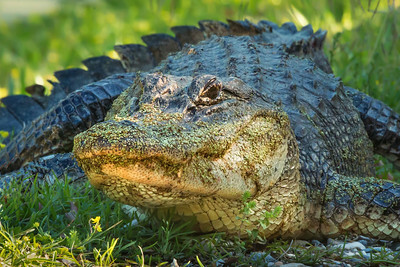 On Avery Island we have actively managed the American Alligator population by collecting eggs and releasing approximately 20 percent of the offspring back into their natural habitat. (Source: McIlhenny Company) This photo appears on on the website www.TABASCO.com, and can be downloaded there at no charge. 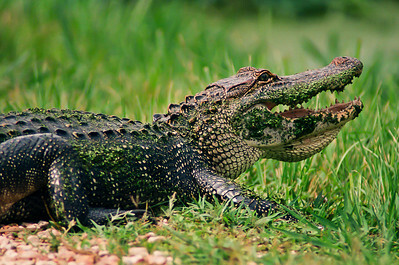 Alligators have the strongest laboratory-measured bite of any animal--equivalent to the force of a medium sized sedan falling on someone. Edmund concurs, citing a friend in college who jokingly stuck his fist into the jaws of a young alligator. That youngster clamped down, and it took several strapping young men to free Edmund's friend's fist. 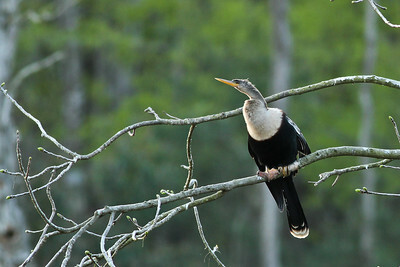 This is an Anhinga, often called a "Snake Bird," because it swims with only its head and long neck above the water. 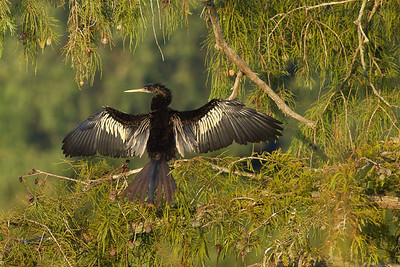 Anhingas have webbed feet, and can dive down and swim underwater in pursuit of fish. They use their sharp beaks to spear their prey. The Anhinga has webbed feet, which allow it to swim underwater. 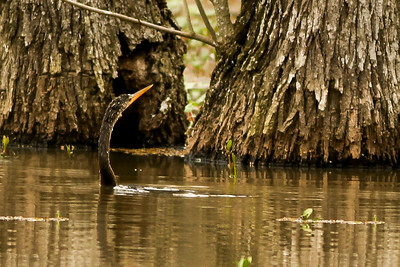 Here the Anhinga is earning her "Snake Bird" nickname. Another reason Anhingas can swim underwater is that they have no oil in their feathers to make them buoyant or water resistant. As a result, they must spread their wings to dry them before they can fly, as this one did on a hot summer day. 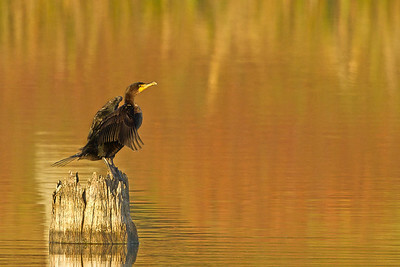 Cormorant on a fall sunrise on Avery Island. Cormorants, like this one, are often confused with Anhingas, because both have webbed feet, swim underwater, and dry their wings in the sun. 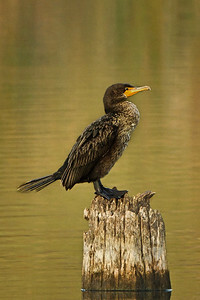 We can distinguish a Cormorant by its curved bill, orange color near its bill, wider body, and shorter tail. 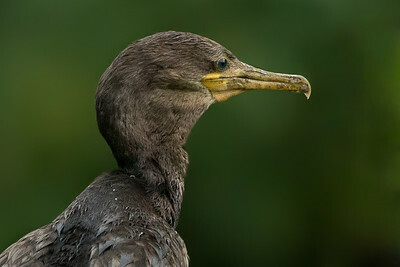 Asian fishermen have used some species of Cormorants to help them fish for over 2,000 years--they place a ring around the bird's neck to prevent it from swallowing its catch. 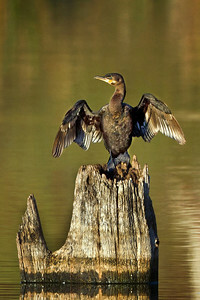 Today U.S. fish farmers complain that Cormorants eat way too many catfish from their farm ponds. 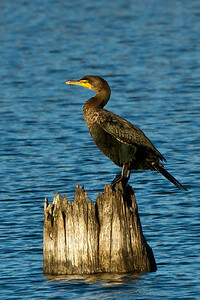 Cormorant on Avery Island. 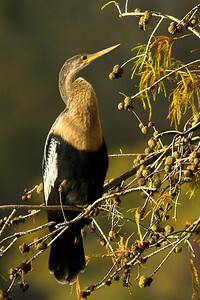 Its curved beak is one feature that distinguishes it from the Anhinga. 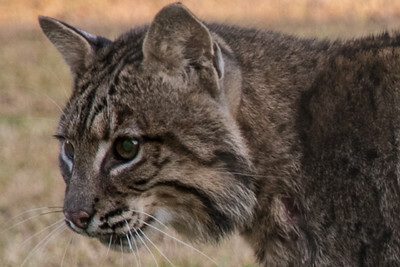 Avery Island Bobcat on Christmas Day 2017. 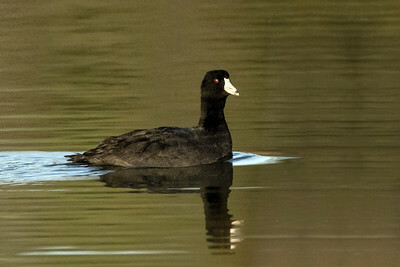 The American Coot, common and widespread in our country, is often mistaken for a duck. While it swims in water like a duck, it does not have webbed feet. Instead, its toes have large lobes of skin that help it swim through the water, but fold back each time its foot is raised so it can walk on land easily, too. It eats mainly aquatic plants, and the oldest known Coot lived to be 22 years old. Source: The Cornell Lab or Orinthology "All About Birds." 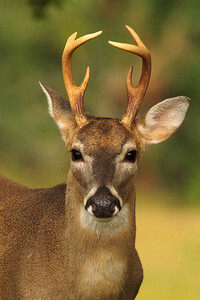 The deer on Avery Island are a subspecies of white-tailed deer called "Odocoileus Virginianus McIlhennyi," named after E. A. McIlhenny back in the 1920's by the Colorado Museum of Natural History, and reported by Frederic W. Miller in the Journal of Mammalogy in February, 1928. 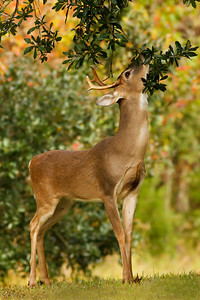 This buck searched for acorns, but dinner was assured, as there are specially planted feed plots around Avery Island to keep the deer healthy. 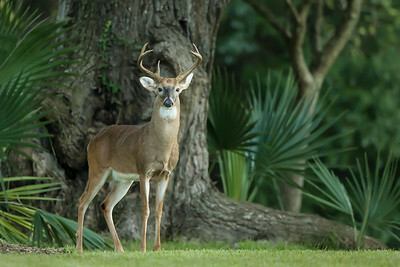 Younger buck on Avery Island.